When was the last time you came up with an excuse to get out of doing something that you did not want to do? Chances are it was today or sometime in the not so distant past. Excuses are just a part of human existence. Many times they are just lighthearted attempts to get out of work around the house, cooking, going to the mall, attending a wedding of a friend who you have not seen in years, or walking the dog. My kids consistently come up with an array of innovative excuses for why they should not go to school each day. In all of these examples, the excuse will not cause any type of monumental disaster. We even use them when there is actually no hope of getting out of the activity for which the excuse was derived. This will cost too much money. It is just another thing that I have to do. It has worked well for so long so why change now. Student safety and security will be compromised. Students will cheat and be off task so I am not allowing them to use devices. We can’t implement this due to the Common Core and an array of state mandates. 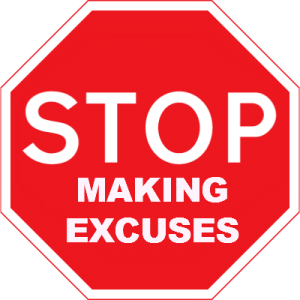 Excuses are fueled by elements such as fear of change, a desire to protect the status quo, lack of education/knowledge, top-down leadership, micromanagement, and the unwillingness to take risks. By no means is this list comprehensive, but it does provide a fairly solid foundation for why excuses dominate the education profession. Sustainable changes leading to cultural transformation in schools can and will only happen when one moves from a fixed to a growth mindset. It is imperative in our respective positions that we create a shared vision that focuses on solutions to problems as opposed to taking the path of least resistance exemplified by the excuse. The best way to accomplish this is to help others see the value in new initiatives and ways of thinking. Provide a clear rationale for change tied to research and examples from other schools where these initiatives have been successfully implemented. Ensure that support structures are in place such as professional development, autonomy, availability of resources, and the establishment of a feedback loop. This will set the stage for empowering others to embrace the change while discovering the value of it all themselves. Most importantly model the expectations that you wish to see implemented and take action.